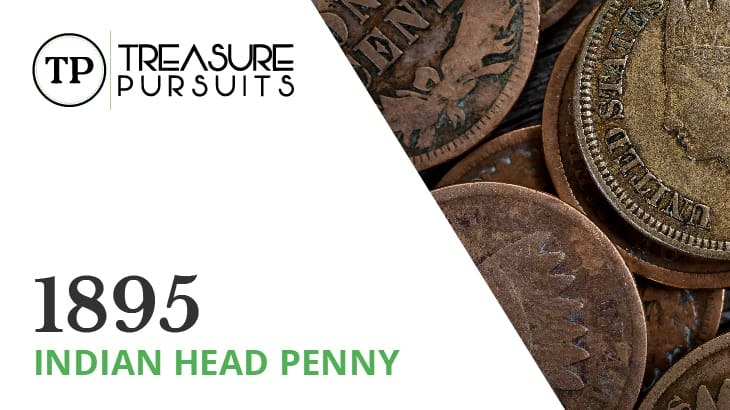 The precursor to the well-known Lincoln cent, the Indian Head penny is beloved by collectors for its simplicity of design and its historical impact on coinage. The Indian Head penny first appeared in 1859 as a new small cent piece that aimed to fix the problems of its short-lived predecessor, the Flying Eagle cent. Both coins were designed by Chief Engraver James B. Longacre. The obverse of the Indian Head penny has a profile bust portrait of Miss Liberty in a Native American-style feather headdress, inspiring the inaccurate but popular misnomer “Indian Head.” Divided between the left and right fields is the legend “UNITED STATES OF AMERICA,” and the year of mintage is at the bottom. The reverse of 1859 had the denomination “ONE CENT” inside a simple laurel wreath decorated at the base with a bow. This was altered permanently the following year. From 1860 onward, the wreath was made of oak leaves, and it was adorned with a shield at the top and a bunch of arrows at the bottom. Both faces feature a denticled rim, a rim of small bumps, and the edge of the coin is plain. As for the composition, the pennies struck from 1859 to early 1864 used a copper-nickel composition of 88% copper and 12% nickel with a mass of 4.67 grams. In order to discourage hoarding (the value of nickel was rather high at the time), the coins began to be struck in a bronze composite of 95% copper and 5% tin and zinc in 1864. These bronze coins had a mass of 3.11 grams. This new composition was used until the end of the series in 1909, the bicentennial of Abraham Lincoln’s birth and the introduction of the oft-collected Wheat penny. In 1895 the country was still in a recession following the Panic of 1893. Nevertheless, the Indian Head penny still saw a return to regular production numbers. 38,341,574 cent pieces were struck in 1895, all of them in Philadelphia. Indian Head pennies would not be struck outside of Philadelphia until 1907, so this issue bears no mint mark. Surviving examples from this issue are common in all grades below Full Red gem and are readily available to collectors. Several die-punching varieties are known for the 1895 Indian Head penny, but the majority do not command extra premiums and do not have much demand among collectors. This issue, being minted after 1864, is minted in the bronze composite, meaning that it is available in three colors: Brown, Red-Brown, and Full Red. This coloration is a result of how the copper tones with age. Brown is the least desirable and most common color, whereas Red-Brown is more desirable, and Full Red is the most coveted color. Full Red examples of this issue are rather scarce in higher grades and can increase the value of your coin to a high degree. The best way to authenticate the color of your Indian Head cent is to have it professionally graded, but you can use the image below to get an idea of what each color should look like on your coin. This issue is considered common, so most grades exhibit low values. However, high Uncirculated grades can bring fair premiums, especially if they show either Red-Brown or Full Red color. In Brown coins, Good-4 to Very Good-8 grades are typically worth between $2 and $4. The value increases to $5.15 in Fine-12, $8.25 in Very Fine-20, $15 in Extremely Fine-40, $25 in About Uncirculated-50, and $41 in Uncirculated MS-60. Uncirculated MS-63 pennies are valued at $67, and MS-65 coins may be worth as much as $165. Average proof strikes tend to be worth around $160. In Red-Brown, the values increase. These coins are worth $45 in MS-60, $125 in MS-63, and $450 in MS-65. MS-66 specimens carry a value of $775. Full Red coins command the highest values. MS-60 examples bring $55, and the MS-63 grade jumps to $190. The value increases dramatically to $525 in MS-64, $900 in MS-65, and $2,300 in MS-66. An MS-67 Full Red example commands the impressive value of $27,000. In 2006, such a coin sold for over $40,000! If you think you may have a Full Red or even Red-Brown 1895 Indian Head penny, it is almost certainly worth the time and effort to have it professionally authenticated by a coin-grading service such as PCGS or NGC.